A few weeks back I received an invite to attend an investment talk hosted by ABSA stockbrokers. Sometimes these things are shameless sales punts and so I was hesitant to attend, but seeing I had nothing planned for the proposed evening I decided to drag my wife along for a worst case scenario of some coffee and free food. The speaker for the event was the Chief Economist from Saxo Bank, Steen Jakobson. He seemed like a very sharp guy and covered some interesting topics, like Brexit, China and the Dollar. He also raised some points which I was fully in agreement with including how important education is to an economy. He was also very critical of the US Fed and their inability to predict negative growth - basically asking why do we even bother to listen to any of their predictions. I had to laugh though, when a few minutes later he himself started making bold and sweeping predictions (including that the USA will go into a recession). Of course I am sure that he is very good at his job and extremely smart, so some of his predictions may well come true, but some won't. And the thing is "predictions are hard, especially about the future" - and at the end of the day none of it actually matters. If the USA goes into a recession, so what! It won't be the first time this has happened and it certainly won't be the last. It is beyond my control and doesn't change anything. I will continue along my way and just keep doing what I have been doing. I can of course see how this may stress some investors with shorter time frames1, but on my 15 year plan this is all just noise. There are going to be a tonne of bad predictions and and investment "crises" along the way. Some very good diversification in this mix! But then he adjusts some of the weightings based on his current view (i.e. predictions!) For the record he is currently overweight gold and underweight equities (quick get out your notepads and scribble it down :)). His general starting point gave an interesting mix and maybe something to do some further reading on? Although I am still leaning towards considerable more equities due to my current very long term view. So what does all of this have to do with this mystical "Money Fountain" I mentioned in the title of this post? Well the other take away from this presentation is that we each received a goody bag, filled with....well....goodies. One of these goodies was a book called the Money Fountain written by Robert J Van Eyden and P D Wells (A South African). In short it is about a Rugby player who does incredibly well and rises through the ranks all the way to the top, only to have his career cut short through injury. He is left with no income and a mountain of debt. This fictional rugby player goes on to meet a random stranger who says he will teach him about how to become financially free. He get's introduced to a few other characters who are there to teach him the various aspects on how to create his money fountain. There is a lot of talk about the goddess of Good Luck and a character called Destiny and it all gets quite whimsical at times. Some of the dialogue is also a little contorted and panel-beated into becoming wealth lessons for the readers. But having said that, it is an easy read and there are some good nuggets of advice. I liked the idea that credit cards should be called debt cards instead, and in that way may help people see them for what they really are, and possibly allow them to be more cautious. I also agreed with the strategy of attacking bad debt as a priority. You can read some reviews on the book here and here. Pay yourself 10% of your take home pay/salary by investing it in something that will compound at 15% per annum. If you do this for 25 years you will be financially free. 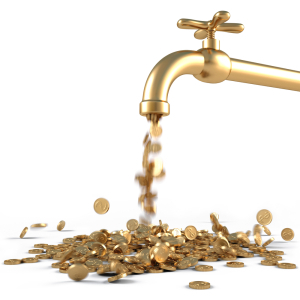 The Money Fountain - so does it work? I thought I would put the books lesson to the test and see if it holds true. 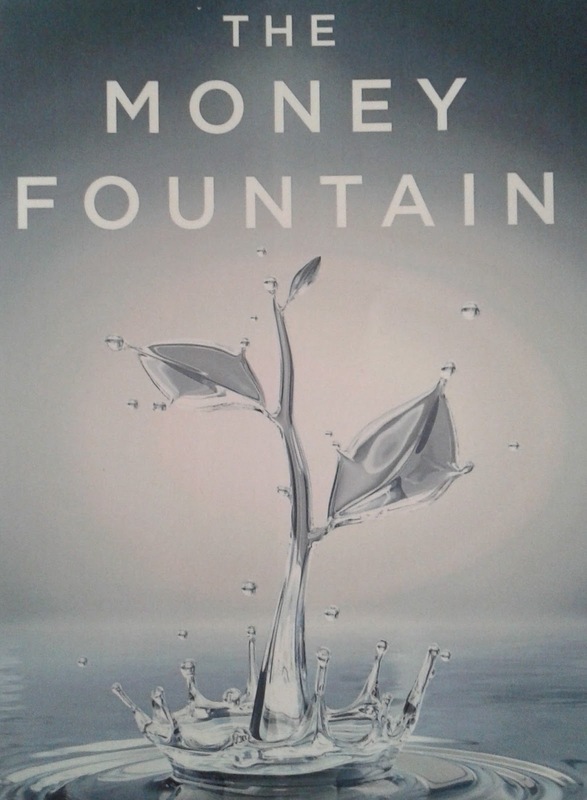 The book stated that the secret to the Money Fountain was true no matter how much you earned. So because of my round number fetish, let's assume an income of R20 000 per month (R240k/annum). Then according to the book, you should pay yourself R2 000/month, which means that living expenses will be R18 000/month, or R216k/year. Now the book says that you should invest in companies that are environmentally responsible because these companies will outlast those that aren't - personally I am not in agreement with this strategy. Reading between the lines I interpret the book as hinting to invest in the Coreshares Green ETF - this ETF tracks the Nedbank Green Index. Now this poses a problem - the track record of the ETF is 6% p.a. over three years (versus the ALSI return of 12.8%. Unfortunately the ETF does not have a longer track record, but it has under performed the general market, and does not seem to be anywhere near the 15% return that the book requires. So instead I am going to assume that we did find something that gives 15% (maybe a local market ETF- see my blog post on Inflation Rates and Investment Returns.) I will also assume inflation of 6.28% - see the Stealthy Wealth Numbers Page. So let's first see what the cost of living would be in 25 years time. For this we inflate the current cost of living (R216k a year) at 6.28% for 25 years. Projected cost of living => R990 244. Now let's see what lump sum get's generated by investing R2 000 per month for 25 years (and each year we assume an inflation linked salary increase so the R2 000/month is adjusted for inflation at the start of each new year). Lump Sum After 25 Years = R8 418 584. Hmmmmm, now can you see the immediate problem? Wow that is huge, and quite simply not going to cut it! According to the 4% Rule for Retirement you should not be drawing down more than , well 4%, of your capital. So this is nearly 3 times too much! So is the book totally wrong? Well I also just realised that the book recommends you should allocate 20% of your salary to paying off debt. So maybe we can assume that all your debt will be paid off by the time the 25 years is up. Also it means that the cost of living is actually only 70% of the take home pay (because 10% was used to invest, and 20% was used to pay off debt, and now this debt expense no longer exists). When I run this scenario I get living expenses after 25 years of R770 190. Well, still not good enough. That's a drawdown of 9.15%. Still way too high. So now I was racking my brain - could the book be that wrong? What else could I be missing? Maybe my inflation estimation is too high? So I run the scenario with 4% inflation and 70% take home pay cost of living.....and...... drawdown = 6.29%. Getting better, but still too high! Either way, all this left me unconvinced of the fool-proofed-ness (I made a word) of the Money Fountain. Some good lessons in the book, but the underlying message does not seem to cut it. Okay so as a last little exercise, I started upping the savings rate to see what percentage you would need to put away each month to meet the criteria of the 4% rule. So inflation is now back at a more realistic 6.28%. I am still assuming using 20% of take home pay for debt, and all debt is paid off at the end of 25 years (and then no new debt in retirement), Then assume you are able to put 20% of your take home pay into an investment. So this effectively means being able to live on 60% take home pay (excluding debt payments). In this situation the drawdown requirement will be 3.92% after 25 years, and we finally have something that meets the criteria of the 4% rule. 1 If you are concerned about next year you really should not be invested in equities in the first place? Your money should be safely parked in Cash/Bonds right?